I used Valis’s NMEA monitor program (NavMonPC) to check out my output string. The top picture is of the basic sensor in self-test mode. The arduino makes a pulse for testing that should show 5.5 kts. The yellow wire connects the pulse output to the pulse input to be measured. 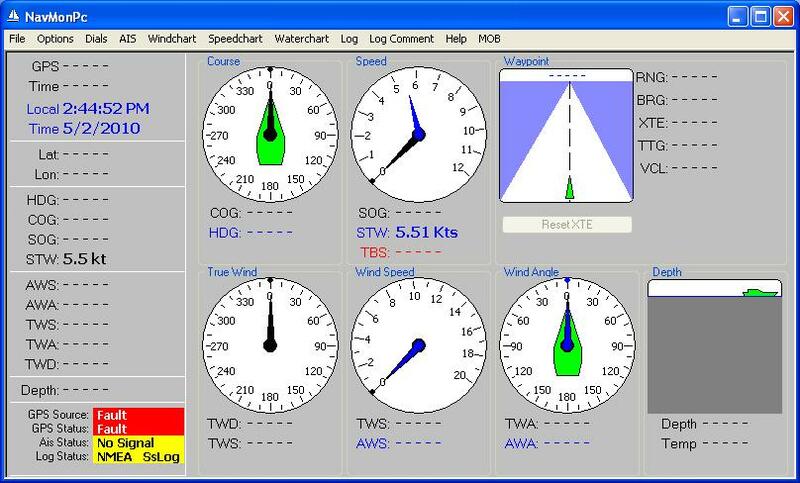 Here is a screenshot of the output of the NMEA string received by hyperterminal. Here is a screenshot of NavMonPC showing the display. On power-up the microcontroller waits for a +++ sequence for a few seconds, if it receives it, it enters a calibration mode so you can change things like the filter pole and the number of pulses per mile. You can also change these in the code itself. I tested it with a speed transducer my dad gave to me from his box of parts. It’s from a raymarine st-50 system, the tag says Airmar Z092. I put 13V to the red wire, ground from the arduino and my power supply to the bare wire, and connected the green wire to pin 3 THROUGH a 10K OHM RESISTOR. The resistor is important– the atmel microcontroller has diode clamps to protect against over/under voltages but you need to limit the current so the diodes don’t blow up. If your input is in the 0-5V range you don’t need the resistor. My paddlewheel I believe is creating 1pulse per rotation. So I guess a bit of calibration is all it takes to transform my analog paddlewheel sensor to an nmea 183. I´ve been trying to figure out what code string to do some trial/error (See if the 6.3kts goes up/down when using the test signal). But I´m no code reader!! If you could point out for me would be great. Thanks for your comment! There is a calibration routine, if you type +++ at the terminal window in the first 5 seconds after boot, it will walk you through changing the parameters. It’s a little awkward with the arduino terminal with its send button. If you don’t use this you can directly change the code. There are 2 constants in the code for the speed per pulse. If you double either you should get 12.6 kt with the test pulse. The first is how much distance the boat moves per pulse and the second is a fudge factor used in calculating speed. Like your take on repurposing a depth sounder transducer. I bought a yacht in which the head unit was broke to this will give be an opportunity to get a display in the cockpit. Nice. Have you considered running the code on an ESP-32? Its faster and has embedded bluetooth and wifi. This code should work on an ESP board. The EEPROM read/write and pin change interrupt code would be slightly different however. And if you wanted to use bluetooth or wifi you would need to add that code. I have used ESP8266 boards for several projects and think it is a fine idea if you wanted to extend the basic functions in this project. Thanks so much for your great article. This is my first arduino project and I was able to get the sketch compiled and uploaded but I’ve got too issues. Any advice is greatly appreciated. I’m currently using the jumper from 10 to 3 until the paddlewheel arrives. #2 Issue resolve by going to File -> connections -> serial port and setting to correct com port and hitting the connect at the bottom of the screen. Somehow I missed the connect option earlier. Thanks! Thanks for quick response. I’ve gotten through the calibration and no more bad eeprom. I’m trying to test with a Airmar ST650 speed sensor that has three wires, Blue, Black and Shield. I’m powering the uno r3 through usb and have tried connecting the wires in all the ways I can think but still getting no response. I should mention I’m a complete novice in arduino and only understand the basics of electronics. Any thoughts? A reseller (https://maxmarineelectronics.com/product/datamarine-astx-20bth-31-279-1-51-speed-insert-only-3-wire-st650/) says maybe blue=12V (usually red); shield=ground (both power supply ground and arduino ground); black=signal to arduino. Don’t forget the 10k resistor on the arduino pin when running more than 5V into it. If you accidentally put 12V into the arduino anywhere you may have burned it out (sometimes just that pin dies, sometimes the whole chip) so be careful. I don’t know if this is correct. Thanks so much for your comment. I’ve verified that pin 3 is still operational with the jumper wire to pin 10. Great feature you added there! I’ve also verified that the paddlewheel oscillates voltage on 90 degree turn 5 another 90 degree 0 but still get 0 for speed in hyperterminal and serial monitor. Not sure where to go from here. Thanks again for all of your help, code and inspiration! I’ve discovered using a multimeter that the output of the sensor, the link you showed is the exact one, alternates between 0.3 and 0 which is not enough to trigger a signal on the arduino. I’m thinking it is either a bad sensor or you would have to amplify somehow to trigger a high signal. Thanks again for your code and thoughts! Thank you very much for sharing this piece of code. I need the STW in nmea on my boat for a openplotter/opencpn tactical processor. But I have a Seatalk Bidata: spiting out only seatalk data. So first I thought of taking an arduino and translate the seatalk into nmea – which isn’t that easy. Than I found your site and this is the solution. Everything is ready, I’ve put the code on the arduino and it runs with the demo data. Great think – thank you…. One think I’m still bothering about: my Hull sensor is with three wires, so I assume its a hall-effect sensor type. So I have positive and grounds going in, and I have the signal coming out. Do you know or think, that it is possible to have the signal wire used for both systems: seatalk and nmea? So splitt the signal in a Y type of cable and use it for the arduino to calculate nmea and the other end for the seatalk device in the cockpit which gives me the speed and depth. Grounds should be common grounds as I do not think that the Bidata-device is opto isolated. So just feeding the pulse in the arduino should be fine. But can the same pulse also feed the seatalk device at the same time?